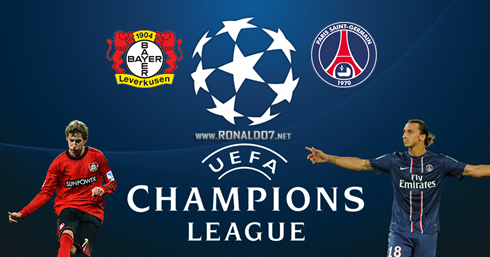 ﻿ UEFA Champions League last-16 round: The complete preview! 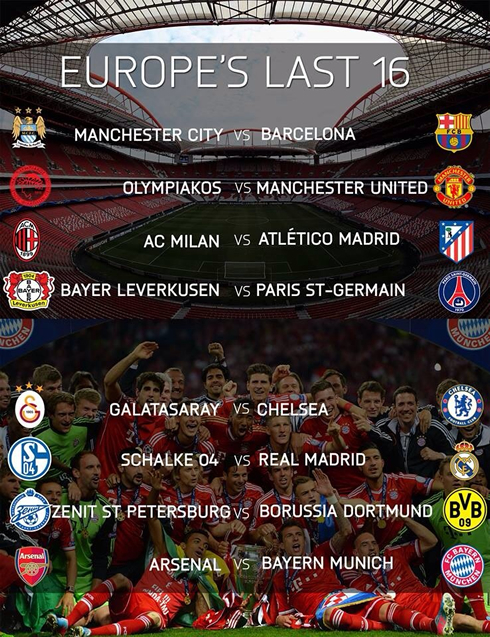 16.12.2013 » UEFA Champions League last-16 round: The complete preview! The UEFA Champions League has finally reached its final rounds and having in mind this is the competition every player in Europe dreams about winning, we're certainly in for a treat. Real Madrid and Ronaldo will lock horns with Schalke 04, but it's the Manchester City vs Barcelona and Arsenal vs Bayern Munich clashes that inevitably stand out the most from this last-16 draw. 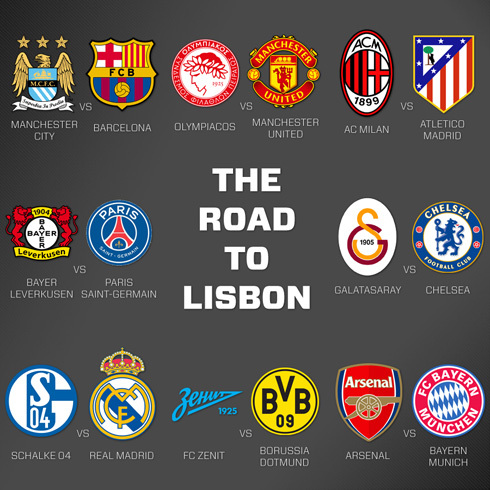 Lisbon will host the UEFA Champions League final next May 24, exactly 19 days before the 2014 FIFA World Cup kicks off [June 12], in Brazil. Sixteen teams have made it through the group stages of the competition and earlier this Monday, they've all met the name of their next opponent for the last-16 round of the Champions League. The draw was held in Nyon, Switzerland and as expected, just by looking at the match-ups we came up with, there are few doubts being raised about the high-level of excitement we'll have in the games ahead. 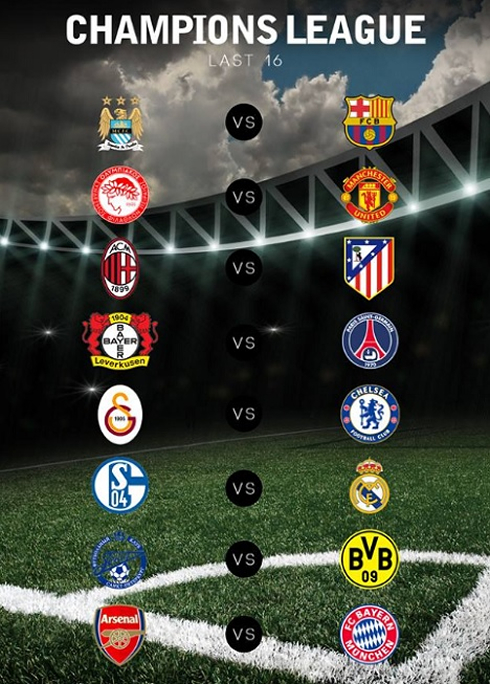 Even though the top 3 favorites to be crowned European champions remain being Bayern Munich, Barcelona and Real Madrid, let's still take a closer look at all the teams and clashes taking place next February and March of 2014. Let's start with one of the blockbusters ties of the season, putting two of the strongest teams of the competition face to face right away. Manuel Pellegrini's Manchester City has reached the last-16 round of the Champions League for the very first time in the club's history and they are certainly striving to make an impact now that they are in town. The Citizens qualified from Group D together with big favorites Bayern Munich and they are definitely talented enough to put on a good fight to any team out there. Barcelona in the other hand, is far from looking as dominating as they've been a couple years ago, but they are still a force to be reckoned as long as Lionel Messi is fit. The Argentinian has been struggling with injuries since the beginning of the season, but is expected to return on January 2014, more than in time for the last-16 first leg tie at the Etihad Stadium, scheduled for February 18. 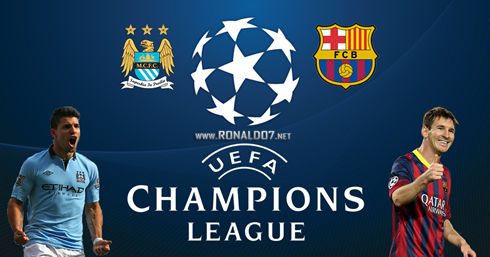 You can get your Champions League tickets here, so if you're planning on watching this game live, we advise you to book your tickets as soon as possible. The Greek champions Olympiakos made it out of Group C behind PSG, but got the better off Benfica in the standings, over the course of the group's six fixtures. They'll be trying to at least repeat their best campaign ever in the Champions League and which dates back to 1999, where they've managed to reach the competition's quarter-finals. They will heavily rely on Konstatinos Mitroglou's prolific goalscoring capabilities, but they are set to go head-to-head with the current English champions Manchester United, and that immediately makes them the obvious underdogs. 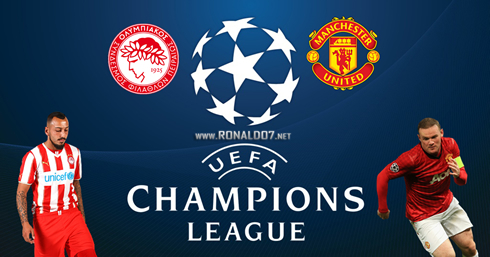 Ronaldo's old club Manchester United face off against Olympiacos, in a season of the adaptaton process to their new manager ideas [David Moyes], has had its fair share of bumps already. The Red Devils have been quite poor in the English Premier League this season but somehow, they've managed to finish on top of Group A without even knowing what the bitter taste of defeat feels like. They may not be one of the strongest contenders to the Champions League title this year, but they were definitely lucky in the draw and now they are more than favorites to reach the quarter-finals. Here is a game where the odds to go through might seem as if they were turned around, at least for those who haven't been following these two teams over the past couple of years. 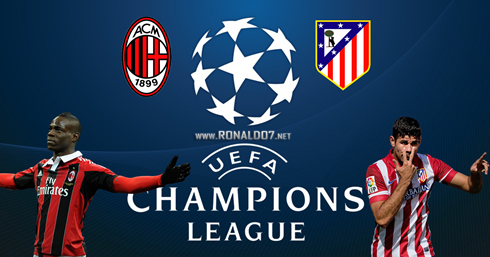 Diego Simeone's Atletico Madrid will go into this tie against AC Milan clearly carrying the favorites tag, which wouldn't make much sense to many football enthusiasts if we were talking about any other period in History other than these last couple of years. The Colchoneros imposed their law on Group G, finishing ahead of all competition with 5 games and 1 draw. They are one of the most solid teams in this Champions League edition and with David Villa and Diego Costa in their attack line, they have enough power upfront to intimidate any opponent. In the other hand, AC Milan is no longer close to be that team capable of dictating terms in Europe as they've done it for so many years and even if Mario Balotelli finds his best form by February, it's not very likely that they'll make it through into the next stage of the competition. Leverkusen is one of the few sides that made it to this stage by qualifying with a negative goal aggregate (9 goals forward and 10 goals against). They outplayed both Shakhtar Donetsk and Real Sociedad as they paved their path to the last-16 rounds and they only came short to Manchester United in Group A standings. They are probably the third strongest German side of the moment, but they'll have very few chances of repeating their most succesful campaign of 2002, a year where they reached and lost the UEFA Champions League final against Real Madrid by 3-0. At the other side of the barricade is PSG, the current French champions and definitely one of the sides to have into consideration when talking about serious Champions League title contenders. They have never made it through this competition's semi-finals, but they have high hopes of doing so this season, especially with players such as Edison Cavani and Zlatan Ibrahimovic feeding their dreams. One of the biggest group stage stunts was pulled off	by Galatasaray, the current Turkish champions. They made it out in second place in Group B behind Real Madrid, but surprisingly ahead of the Italian champions Juventus. They rely on the talent and experience of the likes of former Chelsea legend Didier Drogba, as well as Wesley Sneijder and Burak Yilmaz, but they're on the verge of going into a mission who many believe to be doomed to failure. 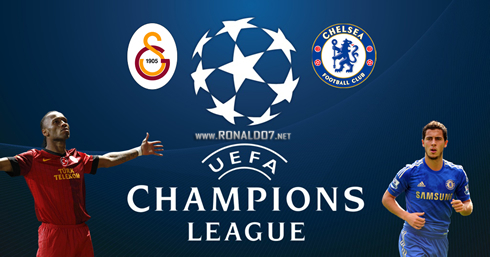 Galatasaray will lock horns with José Mourinho's Chelsea FC, a team that can only get better with time and that currently holds one of the strongest mixes of youth and experience in the game. Drogba will most likely earn a very warm welcoming at the Stamford Bridge next March 18, but it's his old club Chelsea FC who seems to be clearly ahead on this particular race to reach the quarter-finals. The Miners [Schalke nickname] have never went beyond the UEFA Champions League semi-finals and if we had any money available to bet on this tie with Real Madrid, we would safely say that Schalke 04 have minimal chances of going through into the next round. They qualified behind Chelsea FC in Group E, precisely the only team to have beaten them in the competition this season. Their opponent on this knockout stage will be the all-mighty Real Madrid, 9-time European champion and currently the second top favorite to win Champions League the trophy in May. Cristiano Ronaldo will lead the charge and his form in the competition has been beyond impressive, even for his standards. He has already scored 9 goals out of the 5 games he has played, setting a new all-time record for the most goals scored during a UEFA Champions League group stage. Just like in previous years, the Merengues have high hopes and expectations that this will be the year they take "La Décima" home [the club's 10th Champions League trophy]. 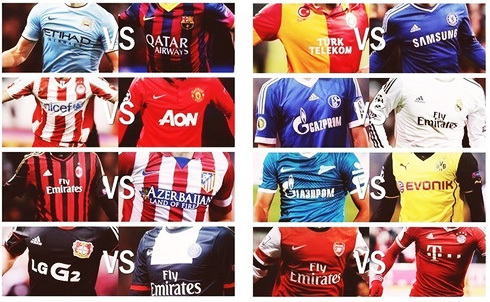 When we look at the UEFA Champions League Group G and Group F, we can't help but to feel a little taste of injustice. While Zenit qualified by finishing second in their group after completing 6 points that resulted of 1 win and 3 draws, Napoli in Group F went out of the competition after finishing third with 12 points and earning 4 wins. That's just the way it is though and Zenit will now have to do a lot better if they want to have legitimate hopes of beating Borussia Dortmund, precisely the side who finished on top of Group F, tied in points  with both Arsenal and Napoli. Jurgen Klopp's pupils seem to have lost some of the gas they have always had in the tank last season, but they are still a force to be reckoned and respected in this competition. They will eagerly look to do better than last season, when they finished as the runners-up on the UCL final against Bayern Munich. 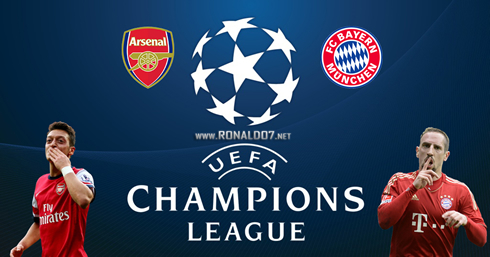 The Gunners could hardly have asked for a more difficult campaign so far in the UEFA Champions League. They first had to deal with this year's group of death, where they've managed to beat every team at least once. They managed to finish second, tied in points with Borussia Dortmund and Napoli and now they got drawn with the competition's main favorites, the reigning champions Bayern Munich. Arsene Wenger's men have had a great start this season and despite their loss against Manchester City last weekend, they are still leading the English Premier League, 2 points clear of the chasing peloton. But it's also fair to say that if Wenger has reasons to be upset with the outcome of the draw, so does Pep Guardiola. Bayern Munich look as strong (if not stronger) than last season and having in mind that they have won a historic treble with Jupp Heynckes just a few months ago, that's probably enough of a statement already to show how impressive and powerful they are these days. Cristiano Ronaldo next game for Real Madrid will be against Olimpic Xativa for the Copa del Rey, this next Wednesday (December 18, 2013). You can watch Juventus live stream, Real Madrid vs Olimpic Xativa, Barcelona vs Cartagena, Stoke City vs Manchester United and Sunderland vs Chelsea, all matches provided from our soccer live section.